When you stay at Kavos Hotel in Chania, you'll be near the beach and 6 minutes by car from Stavros Beach. Free self parking is available onsite. A stay at Symi Garden Studios places you in the heart of Symi, steps from Symi Nautical Museum and 6 minutes by foot from Archaeological Museum of Symi. 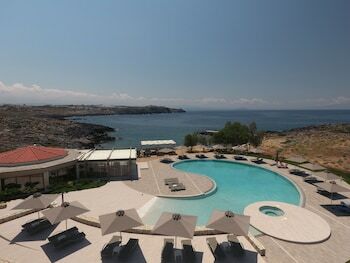 Located in Kassandra, Villa Despina Green Suites is by the sea, within a 15-minute drive of Chaniotis Beach and Pefkochori Pier. Free self parking is available onsite. When you stay at Agroktima in Leonidio, you'll be near the beach and within a 5-minute drive of Poulithra Beach. Free self parking is available onsite.